In a plenary session at the Alzheimer’s Association International Conference (AAIC) today, NIA director Dr. Richard Hodes discussed innovative ways to conduct research, share data, and translate findings into practice to accelerate Alzheimer’s and related dementias research. NIH supports infrastructure and initiatives to enable Alzheimer’s and related dementias research from discovery and preclinical development through clinical trials. To learn more about NIH-supported data resources and initiatives, click on the links below. The AMP-AD program is a precompetitive partnership among government, industry, and nonprofit organizations that focuses on discovering novel, clinically relevant therapeutic targets and on developing biomarkers to help validate existing therapeutic targets. The ABC-DS study is a joint study conducted by two groups of research collaborators—Neurodegeneration in Aging Down Syndrome (NiAD) and Alzheimer's Disease in Down Syndrome (ADDS)— and is supported by NIA and the Eunice Kennedy Shriver National Institute of Child Health and Human Development (NICHD). The ACTC will accelerate and expand studies for therapies in Alzheimer’s disease and related dementias. The infrastructure of 35 sites across the United States will address the timeframe, complexity and expense of the recruitment process and site activation for Alzheimer’s trials to find new and effective ways to treat or prevent these devastating disorders. The Genetics of Alzheimer’s Disease Portfolio, including the Alzheimer’s Disease Sequencing Project (ADSP), supports research to discover long term treatments for the disease by the identification of risk factor and protective genes and the underlying molecular pathways. Launched in 2004, ADNI is an ongoing, longitudinal, multicenter study designed to develop clinical, imaging, genetic, and biochemical biomarkers for the early detection and tracking of Alzheimer’s disease. 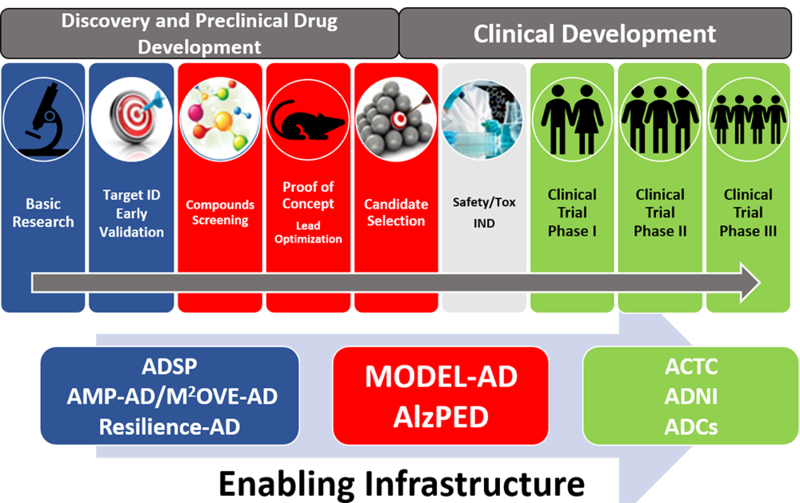 AlzPED is a publicly available, searchable, data resource that aims to increase the transparency, reproducibility and translatability of preclinical efficacy studies of candidate therapeutics for Alzheimer’s disease. NIA-funded Alzheimer's Disease Research Centers (ADRCs) work to translate research advances into improved diagnosis and care, as well as find ways to treat and possibly prevent Alzheimer's disease and related dementias. DIAN is an international research effort to find solutions to treat or prevent this disease and, potentially, all forms of Alzheimer’s. Launched in 2010 as a joint collaboration between the NIA and the Alzheimer's Association, IADRP enables users to assess the portfolios of major organizations for areas of overlap as well as areas of opportunities in which to collaborate and coordinate in a collective effort to advance AD research. The MODEL-AD initiative works to develop, validate and disseminate new, precise animal models of Alzheimer’s disease. M2OVE-AD is an NIH-led team-science venture to build a nuanced model of Alzheimer's disease that more accurately reflects its many causes and pathways. Funded by NIA, NACC has developed and maintains a large relational database of standardized clinical and neuropathological research data. NACC provides a valuable resource for both exploratory and explanatory Alzheimer's disease research. NACC data are freely available to all researchers. The goal of the National Centralized Repository for Alzheimer’s Disease and Related Dementias (NCRAD) is to support research focused on the etiology, early detection, and therapeutic development for Alzheimer's disease and related dementias.